Pigeon Owners Participate in Show at Fayette Fairgrounds. Steve Stanish of Lemont Furnace says he hates when people call pigeons “rats with wings” because they are really beautiful birds with unique colors, markings and features. Now, as a one-time aviculturist, I know that pigeons are wonderful and beautiful creatures and that they are wrongly maligned with a reputation as being a pest species. However, here is an example of a lover of a misunderstood species going on to perpetuate that same misunderstanding of another species, perpetuating the same ignorant attitude that offended him in the first place. 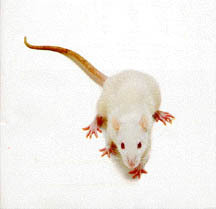 Rats are also beautiful animals, with unique colors, markings and features. Like carrier pigeons who have performed working tasks alongside humans, rats have also trained to be productive in society, promoting human health and safety, in their case by being trained to sniff out landmines and detect tuberculosis cheaply and accurately in third world countries. And as there are pigeon shows (I am no stranger to bird shows, having been an award-recognized exhibitor of exotic finches), there are also rat shows, where rats are also judged for their shape, fur, and color with the same critical attention to detail as other animal exhibitions, although rat shows will probably never have the same popularity because of the prevalence of air-borne rat viruses in the United States that make exhibitions a more risky proposition. They are very beautiful and interesting birds. They don't deserve the bad reputation they have received over the years. I agree, but the same is true of our rat friends. They also do not deserve the bad reputation they have received. So don't be offended when someone calls a pigeon a "rat with wings" (or a rat a "pigeon with four legs"?). It truly is a compliment. Mr Stanish should not be getting angry, he should be complimented, and he should explain why the next time he hears it said. In fact, both species DO have a lot in common. Both creatures are beautiful, intelligent, worthy animals. While the phrase may have been coined in ignorance and intending insult, it nevertheless has a lot of truth to it, in a very positive complimentary way. Rats are very intelligent and can even be taught to do tricks if you are consistent and patient. For a time, we worked with Loki on learning tricks and he was making progress, until he finally decided he just wasn't interested anymore. He would kind of give us that look that says, "What do you think I am, a dog?" and walk away - turning his nose at the Cheerio pieces I had to offer. Loki is his own rat and we learned a long time ago that there is no point in trying to make him into anything else. Now that the girls are approaching five months old, we are thinking it may be time to try working with them. They are still very energetic and maybe too scattered to focus, but they are also very curious and very eager to please if it means a treat. They are more mobile and athletic than our two big squishy boys - and thus much more capable of learning to climb or walk a tightrope or jump a chasm. Unfortunately, they are also easily distracted, so they will probably take a bit of work. Training your rats is a good way to keep them stimulated and entertained while bonding with them in a positive and challenging way. Not only does it keep your rats challenged, but it makes interacting them more stimulating for us as well. I have a long way to go in learning how to be an effective rat trainer, but fortunately, there are some great training videos out there on YouTube. The videos that I have learned the most from have come from crazy4ratties2 on YouTube. If you are interested in some training videos to get you started, I recommend her New and Improved Rattie Training Videos Play List. This includes an introduction to training techniques and detailed instructions for teaching your rat to spin, walk a tightrope, and raise a "bucket" on a string. You can also check out her original training videos play list - which are less polished videos that include the information in the new and improved play list, but also some videos that she hasn't redone yet, including clicker training, and jumping platforms. To give you an idea of what is possible, be sure to check out the video embedded above by Abby Roeser - or any of the videos on her YouTube channel. These videos won't show you how to train your rat, but they will wow you with the possibilities. They all make it look so easy - but it must be a lot of work. Someday, maybe Bella, Ruby, and Jo will be able to make their own video - but for now, I will be content with working on simple things, like Up and Spin. There is a lot more out there on YouTube - so if you are interested, make sure to do a YouTube search on Rat Tricks or Rat Training. There are some amazing rats out there in Cyberspace! 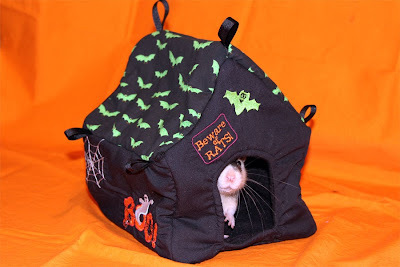 The Tutorials for Common Rat Hammocks and Accessories PDF file has been updated to include a modified version of the Cube: the House. The House is really not very different from the Cube, except that it has a peaked top instead of a flat top. If you know how to make a cube, you can pretty much figure out how to make the house - except that it always helps to have all the template pieces and their dimensions mapped out for you so you don't have to experiment with sizes until you get the proportions right. This particular design is my own original design. I am guessing others may have done similar designs before me - but I haven't personally seen them. I hope the instructions I have provided help others to create similar projects. The House is a little more difficult to make than a Cube - just because the roof is made from two pieces and fitting the roof over the peaked house top can be a little tricky and takes some manipulation to get it right. And if your rats like to lounge on top of the cubes (our Loki does this - stuffing the cube with his stash of fleece and food and sometimes a cuddle cup, then guarding his treasure by lying on top of the cube), then the House, with its peaked roof, is not for them. was not worth the extra effort. Still, the House is a fun addition to themed cages. I have made Haunted Houses for Halloween cages (as shown above), and Gingerbread Houses for Christmas-themed cages, and I want to make Bird Houses for bird or spring themed cages. I like to find a patterned fabric for the roof and use a solid fabric for the front/back/sides. To accent the House in the appropriate theme, I like to use machine embroidery. On the Haunted House, I have embroidered ghosts, tombstones, bats, and spider webs (and a custom Beware of RATS sign). However, this is by no means required. It is really a labor of love. In the past, all the effort put into creating the design, embroidering the patterns, and sewing the final product has all been for naught - they all have been chewed up in short order. However, I now design all my cubes and similar hammocks with a back door as well as a front door. If I omit the back door, the rats are sure to create their own. Hopefully, complete with front and back door, this haunted house will last longer than its predecessors. 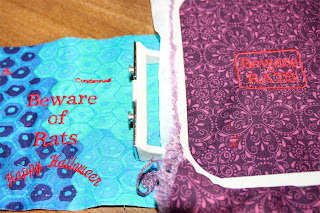 If you like to sew, be sure to check out the tutorials! Things have been quiet on the rat front for us recently. Pirate has recovered from his respiratory infection and is back to his old self and off his medications. He and his three girlfriends are back to using fleece liners in the Critter Nation, as previously reported. This has cut down drastically on odor (mainly because of the thick towels beneath the fleece liners), but chewing has definitely increased. The girls, like many rats, love to burrow under the fleece and chew their way in and out. If I have to choose between chewing damage and odor - odor control wins every time. The chewing damage, I can live with, and repair to a certain point. 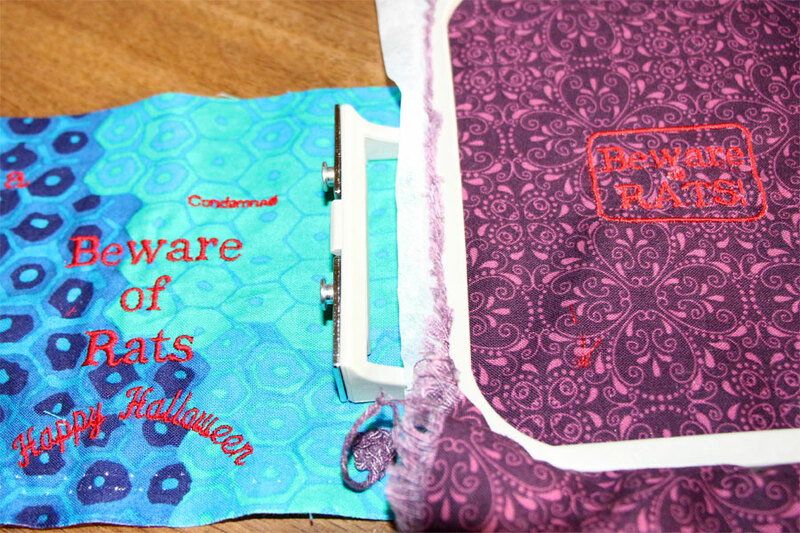 I have been busy cutting fabric for Halloween hammocks. I have one set cut for the Dual Critter Nation and another in the same fabric patterns for Loki's Martins R695. They are all pinned up and waiting to be sewed. I have also been looking into embroidery again, and plan to add some embroidered items to the hammock set - maybe a haunted house variation of a cube hammock with an embroidered ghost/pumpkin/bat, for example. I restocked on colored embroidery thread for my Brother embroidery machine as I needed some oranges to be able to do many Halloween designs, and I purchased a few new designs for download from EmbroideryDesigns.com. I am also playing with a free lettering program (Embroidery Fonts Plus) from that site to create more customized text/lettering/fonts than my machine can do on its own. The interface is terrible (as a software engineer, I would love to get my hands on the code, so I could redo the user interface and update the software using a more modern version of Visual Studio), but it is free and if you can get past the horrible interface quirks, it does create customized lettering designs that work on my machine. Fonts for use with the software run about $10. My only fear is that the software has not been updated, patched, or improved upon in years (and it definitely needs all three), and that eventually, it will not be compatible with future versions of Windows. Anyway, I am looking forward to putting these together and hopefully having them ready by Halloween. Some interesting news about "prehistoric rats" has been circulating recently. Scientists have found a fossil of the species recently named Rugosodon eurasiaticus in eastern China. 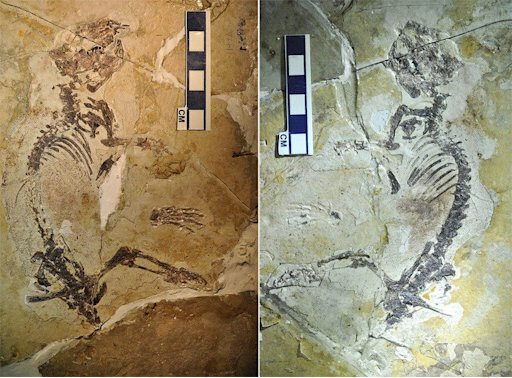 This species is the oldest known ancestor to the modern rat and was believed to have originated over 160 million years ago in the Jurassic period, during the times of the dinosaur. For more information, see the article Chinese super-rat roamed Earth 160 million years ago. 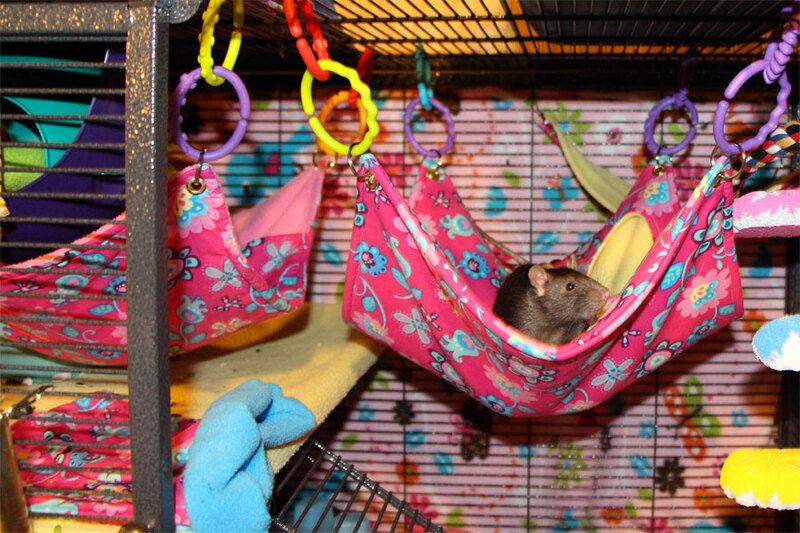 So you've bought or made yourself some beautiful hammocks for your ratties - but there is just one question - how do you hang them? Fortunately, you have several options. Hammocks are made with one of two types of hanging mechanisms: grommets or ribbon loops. Ribbons can be hung as is with any of the hooks described below. However, ribbons are tempting targets for chewers, and so when plausible, grommets are often used instead. 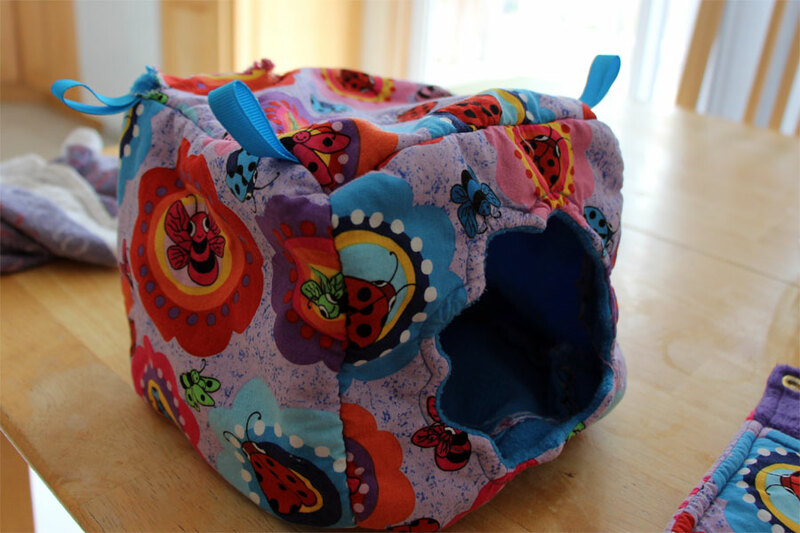 ﻿﻿Grommets hold up better when you have chewers, but the most commonly used grommet size is 1/4" - which by itself is too small for some types of hooks. Because of this, you may want to add split rings to your hammock. 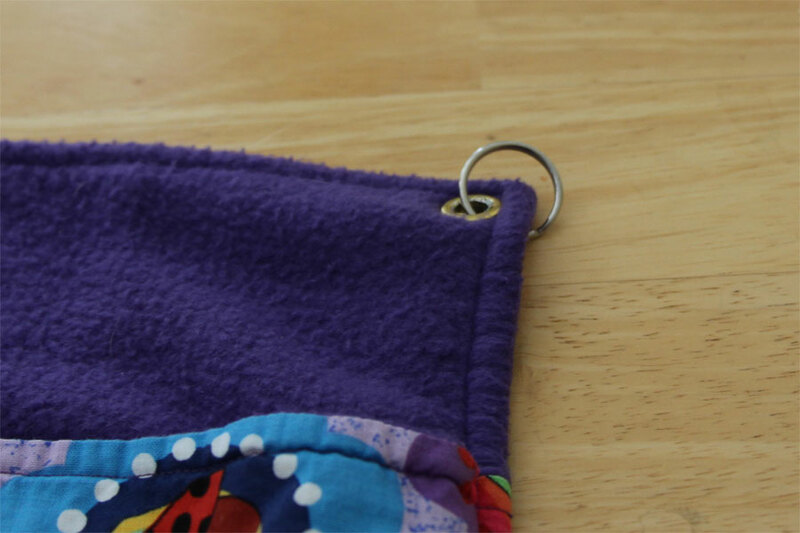 Split rings are key chain rings and they can be inserted into the grommet to create a wider opening for attaching your hook. They can be a pain to attach initially, but they are stainless steel and thus will not rust in the washing machine - so you can leave them on the hammock permanently. There are many different types of items that can be used as hammock hooks. The most simplistic option is a large paper clip. Some even use large safety pins, but I personally would worry about using something so potentially sharp around the rats. 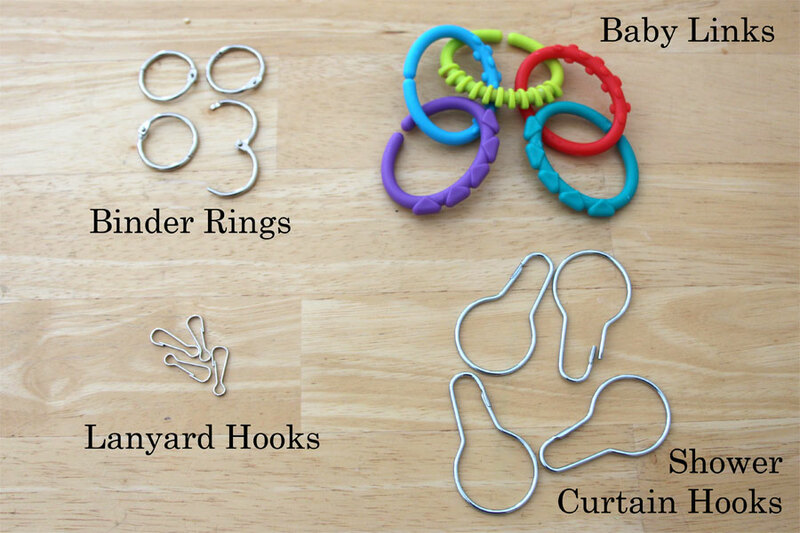 Some options that I have tried include lanyard hooks, binder rings, baby links, and shower curtain hooks. Lanyard hooks come in a variety of sizes, with the smallest and least expensive being the ones shown in the photo above. These small lanyard hooks will not fit well through a standard grommet, so they are best used in combination with split rings. These hooks clip securely to the cage bars and are fairly easy to clip and unclip. 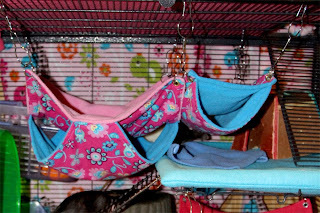 However, because of their small size, they do not allow the hammock to hang down very low when clipped to the top portion of the cage. Because of this, I find they work most effectively on corner hammocks, which clip to the side walls instead of the top of the cage. Note that when hanging a corner hammock in a Critter Nation, it is easiest to attach to the corner by using two lanyard hooks - one to each joining side. If you only use one, it will slide along the bar and not stay fixed in the corner. When you want to hang hammocks from the ceiling and you want to hang them lower in the cage, you will need a larger type of hook. Larger hooks can be linked like a chain, allowing you to adjust the height of the hammock by adjusting the number of hooks used in the chain. Binder rings are an inexpensive option. They come in a variety of sizes and consist of a metal ring with a hinge that opens. Some types of shower curtain rings are also made with this same type of hinge. While these hooks are inexpensive and easy to use, I have found that the hinge loosens and breaks too easily, and thus these hooks last only a short period of time. Some of them are loose right out of the box. These rings also rust if they are accidentally thrown in the washer with the hammocks. Baby links are a favorite of mine for hanging hammocks, but they have a few drawbacks. 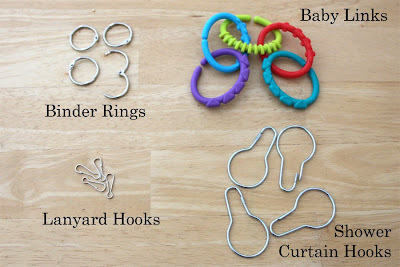 Baby links are the plastic rings that are given to babies to teethe on and to toddlers to string together in chains. 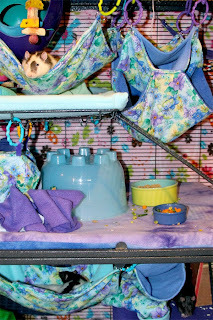 These links are colorful and safe for ratties and they can coordinate with your color scheme to brighten up the cage. They can also be entertainment for the rats. They are quite thick, however. They will not fit through the hole in a 1/4" grommet, so you will need to use split rings with your grommets. They can also be cumbersome to stick through the cage bars in a cage like a Martin's with small bar spacing. 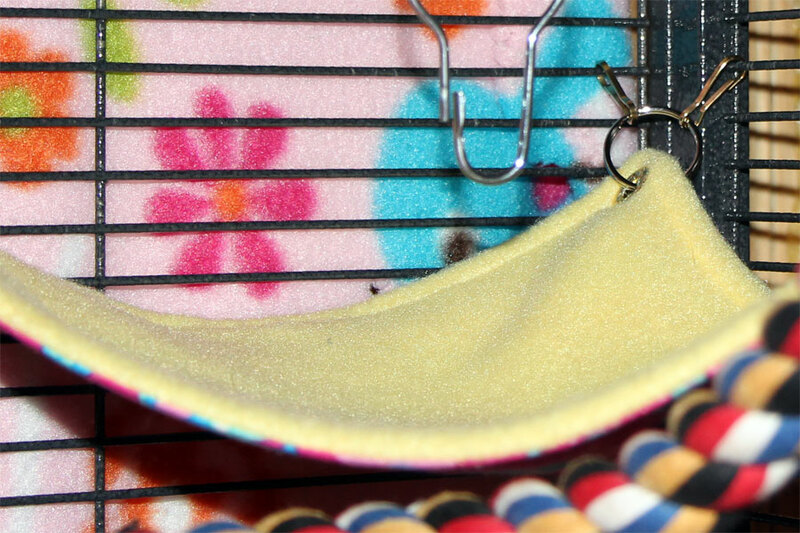 Because the link is always open, it is possible for the rats to occasionally slide the slip ring off of the baby link, causing one corner of the hammock to come loose. Hammocks hung from metal shower curtain rings. Another popular alternative is to use shower curtain hooks. There are many types of shower curtain hooks. I would recommend avoiding the kind with the hinges (like the binder clips). Plastic shower curtain rings are an option similar to baby links, although they can also be awkward to attach to the cage bars. However, they do snap shut, so you do not have to worry as much about the hammock slipping off a shower curtain ring. They can be purchased in a variety of colors and thus can be made to match a color scheme. The most popular type of shower curtain ring for hammock hooks is the inexpensive pear-shaped ring pictured above. They can be purchased in bulk very cheaply from e-bay and are simple but durable metal rings that latch via pressure at an opening on one side. These rings are thin and can easily thread a grommet - although split rings make it even easier to slip the hammock on and off. They are also easy to slip around the cage bars. They are not as colorful as plastic shower curtain rings or baby links, but on the plus side, you don't need to change out your hooks to match every time you switch to a different cage theme. This is a deal worth taking advantage of at JoAnn Fabrics. Through Saturday, all Blizzard Fleece Prints are 70% off. This puts it at $3.29 a yard. If you use fleece liners and have a large cage, this is a sale that could save you a lot of money. I go through about 4 yards of fleece to make one set of pillow-case style liners for a Dual Critter Nation. There was no mailing for this sale, so if you rely on flyers, you could miss this one. You can check out this sale online at JoAnn's website (7-day deals) or at your local store. 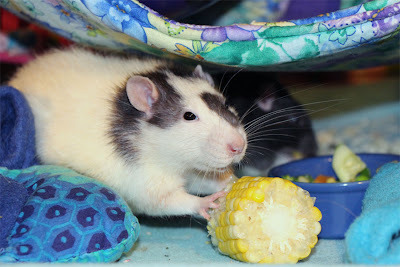 While I like to avoid dried corn in their diet, a little fresh sweet corn every now and then is a welcome treat in our rat cages. Sweet corn is in season now in the Midwest and our rats love to nibble on the corn straight off the cob. And when they are done, they have great fun shredding the cob to papery bits and redistributing them around the cage for me to clean up. 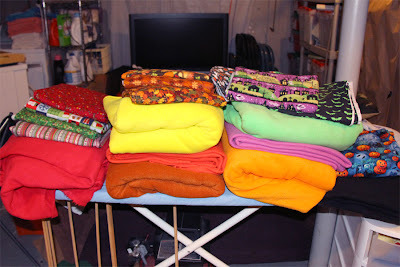 Fabric haul for holiday hammock projects. 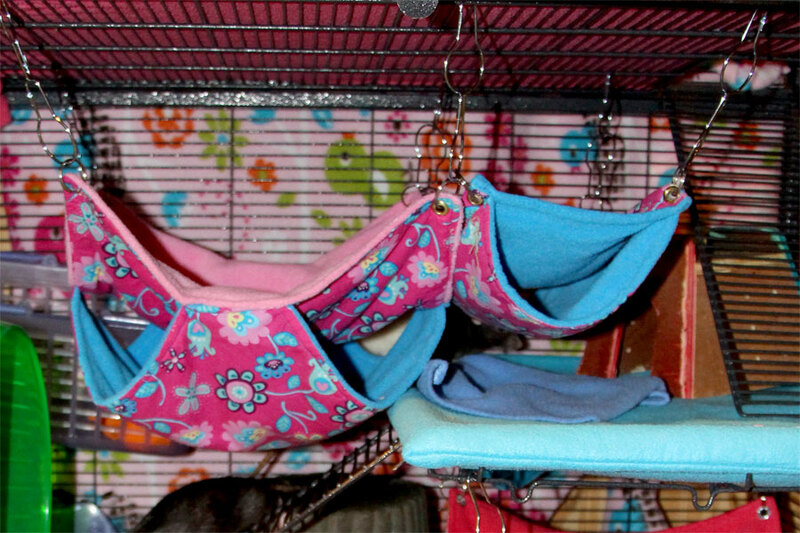 It seems like Life with Rats also means Life Making Hammocks. Even if your rats are not voracious chewers, the constant nibbling on the edges will eventually wear the hammocks down until they hang from threads. Even if they are still functional, they quickly can become unsightly, and if there are loose tangles of threads, potentially dangerous. Sometimes you just get tired of putting up the same old hammocks every time. Part of giving our rats the best possible environment includes changing up that environment - bringing in different styles/sizes of hammocks in different places for a new experience. 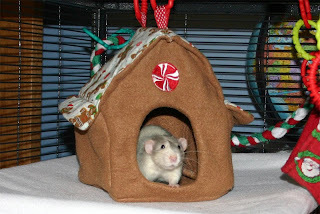 And I like to take a seasonal approach - decorating the cage in fabrics that compliment the time of year. You also always need to have two sets of hammocks in play at a time - one currently in use while the other is being laundered. I am fortunate that I learned to sew when I was in high school. I don't remember much of what I learned (at one time I could sew pleated pants, blazers, and swim suits), but fortunately, I don't need to know anything more than how to wind a bobbin, thread a machine, and sew a straight seam. Most hammock seams are straight lines and most fabric pieces are cut into basic geometric shapes. Sizes and shapes are flexible and the instructions and tutorials are really nothing more than a guide. 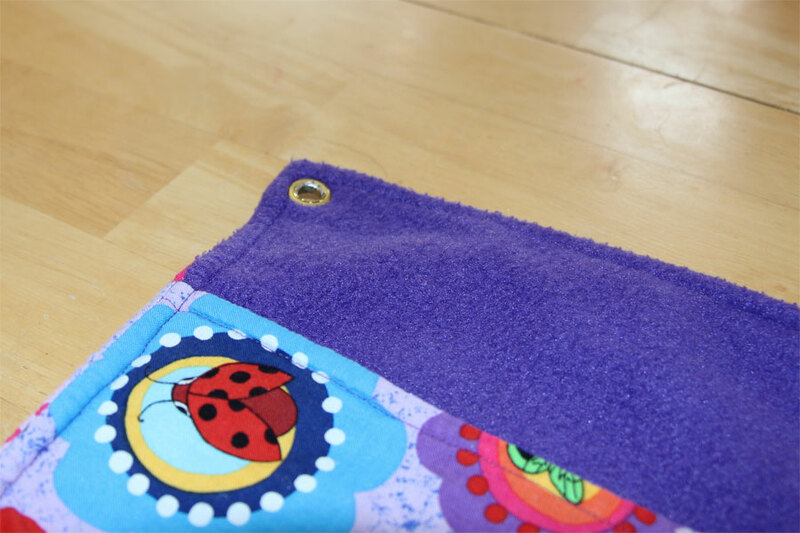 Seams do not have to be perfectly straight. I can experiment with fabric pattern/color combinations and if they come out looking a little wrong, well, the rats don't care about that either. But when they come out looking right (or close enough to right), there is nothing like the enjoyment that comes from hanging them up for the first time and taking in the effect - it is like a brand new cage every time. The rats seem to think so to - from the way they will instantly explore every nook and cranny of the new setup. Making hammocks is so straightforward that even if you have never sewn a stitch in your life, you could learn to make a functional hammock with just a few basic instructions. (Our instructions for many types of hammocks can be found online). You don't need anything fancy - even the most basic sewing machine can do everything you will need to make a basic hammock. I often wonder how people who don't sew tackle the hammock issue. Obviously, one can buy them online from crafters or one can use old clothes, towels, washcloths, fabric scraps, sheets, fleece blankets etc. 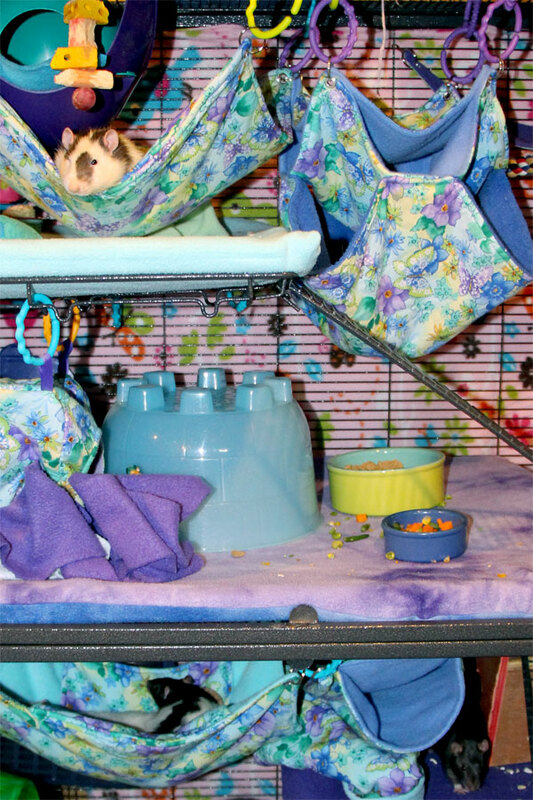 But my family doesn't go through these items nearly as fast as our rats go through hammocks and paying for ready-made hammocks can get expensive considering how quickly they need to be replaced. Just buying the fabric can be expensive even if you only buy on sale. I would hate the constant fabric expense required to replace hammocks if it weren't for the fact that I enjoy picking out new patterns/colors and sewing new sets. 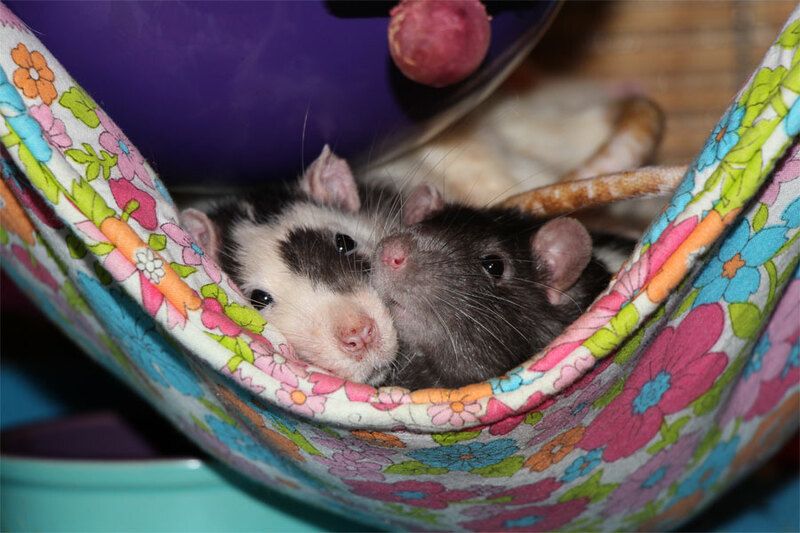 It is like having two hobbies for the price of one - hammock making and rat keeping. 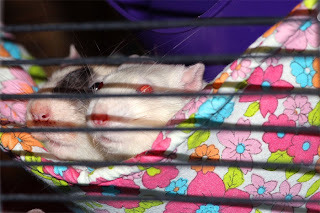 But no matter how you do it, supplying the rats with new hammocks is a constant need when you own rats and now it is time for me to focus on this again. When we decided to adopt some girls this past spring, I got very excited about the opportunity to sew new hammocks - for the first time in girly fabrics. I could pack away the pirate fabric and the race car fabric and buy something with flowers and butterflies in effeminate pinks and purples. I made several sets and they are still in good condition. But they are spring and summer patterns and fall is just around the corner. My holiday themed hammocks have been chewed to shreds, so I need new Halloween and Christmas themes, and I thought I would try a fall/Thanksgiving theme as well. Plus, Loki didn't get any flowery hammocks (they just don't go with his personality - I could just imagine him sulking in a butterfly covered cube thinking to himself, "How embarrassing!"). So I made a big shopping trip to Joann's this weekend (they had Christmas prints 50% off, Halloween and Fall prints 30% off, anti-pill fleece 40% off, plus a coupon for 25% off the entire order). Now it is time for me to get back to work. I still have some girly fabric I haven't had a chance to use yet, but I will save that for next spring's project. What's first on my agenda? Halloween - my favorite holiday to decorate for. I can't wait to get started. Pirate's respiratory symptoms flared up recently and we put him back on his normal regimen of Doxycycline. He also has a prescription for Theophylline, a bronchodilator, which helps open the airways so that he can breathe more easily. His symptoms did not improve and, in fact, started to worsen, so last week it was back to the vet for him. The vet added Baytril (enrofloxacin) to his medication regimen. He gets .5 ml of 22.7 mg/ml Baytril liquid antibiotic (the amount given is dependent on the rat's weight, and while Pirate has lost a little weight, he is still a big boy at over 600 grams). This dose can be given once a day, or divided in half and given twice a day. I give the Baytril directly by syringe to make sure he gets the full dose. This particular formulation must be kept in the refrigerator. While he wasn't feeling well, he took it easy, often lounging in a hammock with Ruby or Bela at his side. But the Baytril works fast and by the end of the weekend, he had bounced back. The congestion has cleared up and he is getting back to his normal, more active self. I can't emphasize enough for those thinking about getting rats, how important vet care is. These respiratory problems are so common in rats, and without treatment, they go downhill so fast. Yet it is fairly easy to treat these problems - at least until they become resistant to the medications you have been using or until permanent damage is done to the lungs and respiratory system. Can you tell the difference between a rat and a mouse if you have no size reference available? Want to find out? RatBehavior.org has a cute and fun test with 12 photos of rats / mice for you to identify. Can you get a perfect score? I was surprised to get them all right - but I am not sure what criteria I used - more instinct than logic. It is just something about the proportions of the face. Give it a try here: http://www.ratbehavior.org/QuizRatOrMouse.htm.